It is cooked everywhere and imitated by many, but the original “amatriciana” was born in Amatrice. And it was just from this village in the Northern part of the Lazio region that one day, back in 1870, a very brave woman left. She arrived with her bundle – “mappatella” in Italian – near the old Termini Station in Rome. And there the woman started to prepare, with very poor means, the renowned “bucatini all’amatriciana” (large hollow spaghetti cooked according to the Amatrice recipe ndt) for some passing greengrocers. With the passing of time, enthusiastic Romans joined greengrocers going to the market in order to taste the appetizing bucatini of the “Amatriciana” (the woman coming from Amatrice). Later the restaurant enlarged to coincide with the construction of the old Costanzi Theatre (1880), later turned into Teatro dell’Opera (1929), and it became more and more well-known and important. The sign, due to a mispronunciation of the Roman dialect, became La Matriciana and the bucatini were renamed as the “5 P’s dish” – pasta, pancetta (bacon), pomodoro (tomato), pecorino (sheep’s milk cheese) and peperoncino (chilli) to which Aldo Fabrizi (a very famous Roman actor), pleasing restaurant’s guest, wished to add the 6th P with a witty remark in the Roman dialect: panza (the potbelly). 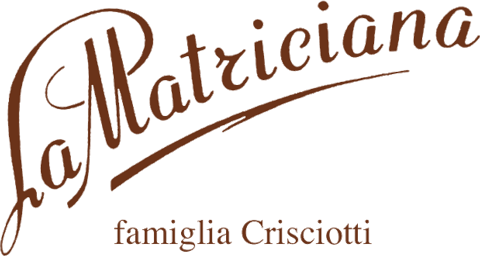 Nowadays the restaurant, owned by the Crisciotti family, is run by Fabio and Mauro brothers, always together with their father Fortunato. Till today the place keeps the original structure of the Thirties. It has a typical Roman cookery, with new proposal for seasonal products, while the cellar tries to be always well-stocked, thanks to a particular attention paid by the two young restaurateurs, who are both Sommeliers at the A.I.S in Rome.